No matter what the season, amirite? A good chocolate ganache cake is always appreciated. Unless, of course, you don’t like chocolate (I haven’t met someone who doesn’t). I’ve always thought that a baker needs a good chocolate cake recipe. With that, good quality ingredients are best to use most especially for cocoa powder and chocolate (f0r ganache). For this recipe, you can easily mix by hand too. If you don’t prefer espresso coffee, switch it up to brewed coffee and adjust the recipe to 1/2 cup coffee and 1/2 cup milk instead. For the frosting, I used chocolate ganache, rich and decadent. Dress up your cake with fun sweet things! There are so many pretty cakes I’ve been seeing on Pinterest where it doesn’t require serious piping skills. 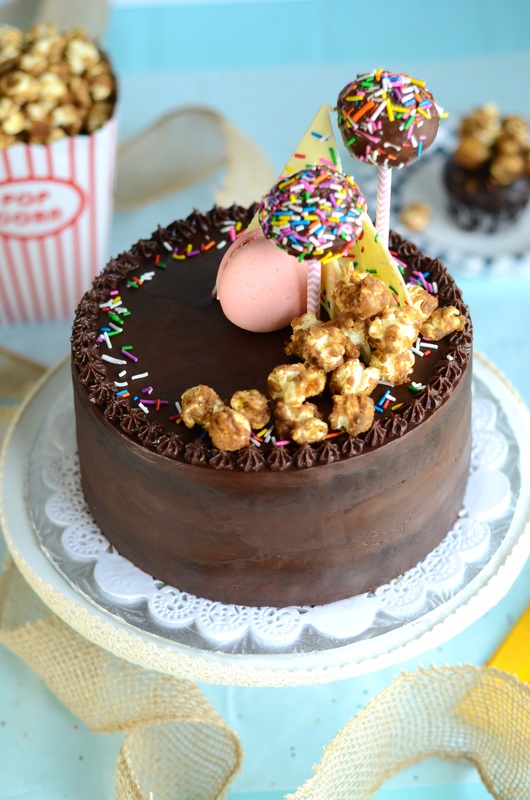 Here are some ideas, add more chocolates say Ferrero Rocher, or cut-up pieces of Snickers or combine both, place on the centre cake. Or use other sweet confections too, like caramel popcorn or macarons. Add rainbow sprinkles for more colour.